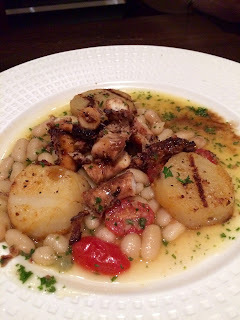 My very first trip to Osteria in Greensboro was right after they opened. I remember the food being pretty good and the entire experience being just fair. I blamed the kinks they were still working out. I wasn't in any hurry for a return visit. Upon my most recent trip, it's safe to say said kinks are gone. The food is sensational and they're doing incredible business - you'll want to make a reservation before you pop in on a random Wednesday! The wine selection is ample, and servers do a nice job recommending wines pleasing to your palate. Delicious homemade rolls - sourdough, I'm thinking - are warm, and served with a salty white bean, onion, carrot and basil chutney. It's easy to make this a little sandwich and inhale it. 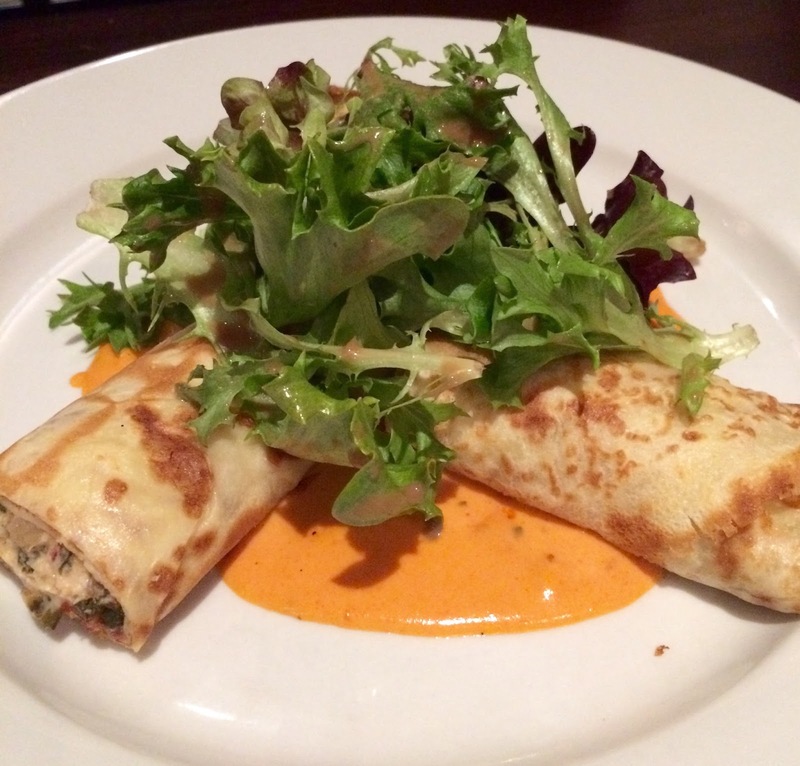 Osteria offers a standard menu as well as several specials. It's wise to order selections from both. Appetizers feature some of the freshest seafood around. 6 large prawns are simply grilled head-on, and a squirt of lemon brings out the sweetness. Grilled octopus is served alongside grilled fingerling potatoes, white beans and roasted tomatoes. The octopus was a little chewy, but the accoutrements made up for it. I just adore a crepe. At Penny Path Cafe in High Point, you can find them filled with cookie dough (be still my heart!) and at Osteria, they are filled with artichokes, spinach, peppers, ricotta and parmesan cheeses, and served with mixed greens and a tangy roasted red pepper tarragon sauce. This dish is scrumptious. However, the show stopper appetizer was two tender grilled scallops served on a sea of beurre blanc (white butter sauce), with roasted plums and a plum reduction. HOLY SMOKES. 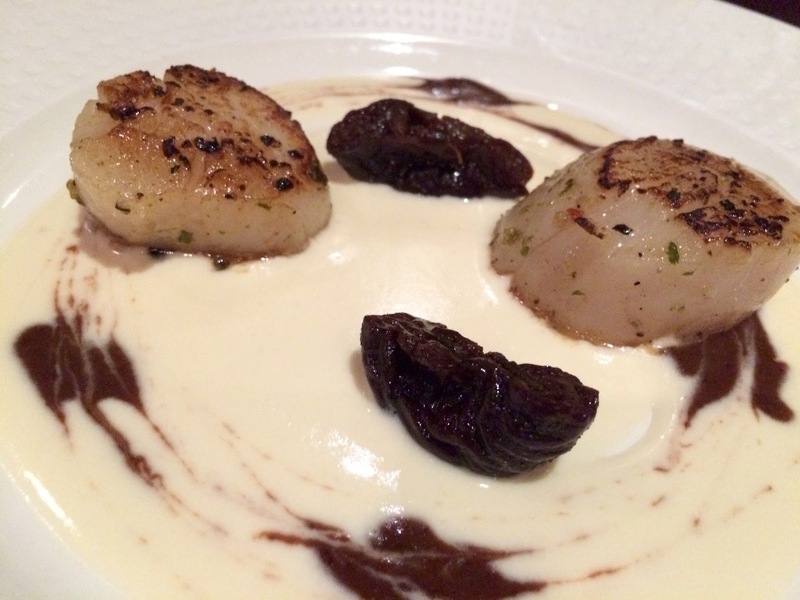 The texture of the scallop is exactly like the tender plum, and the beurre blanc is so rich that the tartness of the fruit is a perfect way to cut through it. This was the best thing we tasted all night (and we tasted a lot). When you're at an authentic Italian restaurant, you can suspect that the pasta is made in-house. 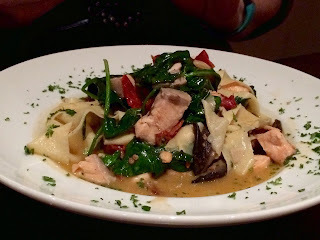 The pasta dishes we ordered reminded us of how fabulous fresh, homemade pasta really is. Pappardelle is uber thin and practically dissolves in your mouth! 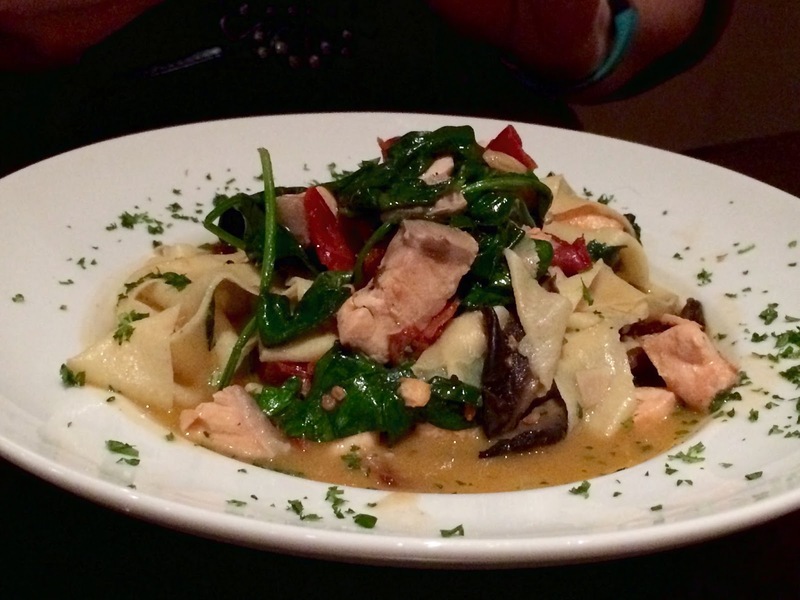 The thin ribbons are served with mushrooms, sundried tomatoes, spinach and grilled salmon in a delightful broth. Hint - use some of the homemade bread to sop up the broth. Scungilli Arrabbiata will not only test your Italian speaking skills, but your self-discipline too, as this is easily a serving for 2+ people. A huge, steaming hot bowl of strozzapreti noodles (long corkscrew shape) is served with a spicy tomato sauce and fresh sliced Conch. How freaking cool is that? Conch?! The slightly briny flavor of the meat reminded me of a mussel, and it's texturally a bit chewy like a clam. It's a delightful dish. 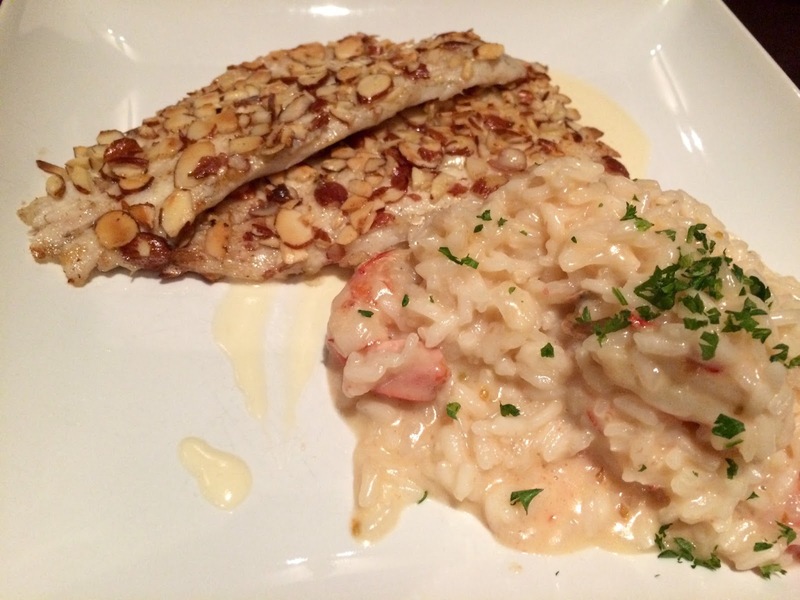 Branzino is a European Sea Bass, almond-encrusted, and served with some sensationally creamy Mascarpone Risotto. Did I mention that shrimp and roasted cherry tomatoes are also featured in this risotto? It's seriously outstanding and insanely rich. You get two filets of the fish, and you'll want every bite to mop up the beurre blanc it's lying on top of. I'm not a huge fan of Italian desserts, so I wasn't too keen on the Decadent Chocolate Cake, which was more like a chocolate lava cake minus the liquid center. It was too gummy for me, like a flourless cake, which is probably how it should be listed on the menu. The housemade gelato it comes with though, is an entirely different story. A sweet vanilla gelato is swirled with black cherries and tastes like icing. I didn't have an ounce of room left until I tasted it, and then I found plenty of room. 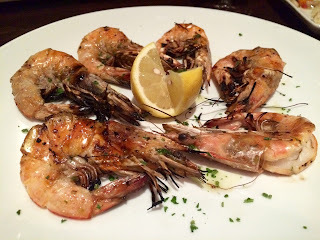 Give Osteria a visit if you haven't been, or if it's been a while since you last went. They are clearly doing something right - every table was packed at 6pm on a Wednesday. For the most part, service is very good, but more frequent checkbacks and a quicker serving pace would make a great evening outstanding. Regardless, you will enjoy the cuisine.